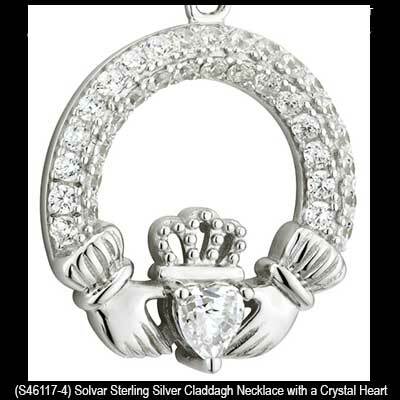 Sterling silver Claddagh necklace features a crystal heart, the alternate April birthstone. This birthstone Claddagh necklace features a lab created crystal heart along with two rows of Cubic Zirconia stones that are set from wrist to wrist across the top of the pendant. 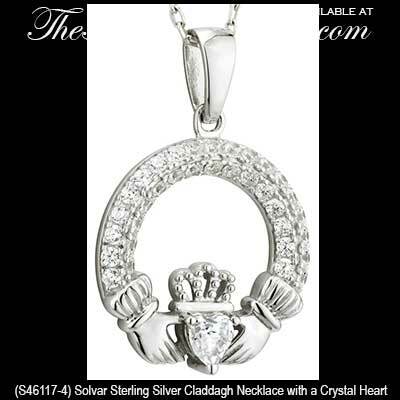 The crystal Claddagh pendant measures 3/4" wide x 1" tall, including the jump ring and the chain bail, and includes an 18" long sterling silver chain.